"They always go above and beyond. We won’t take our vehicle anywhere else. I trust them to tell me exactly what is wrong and not to add on any unnecessary issues. They are extremely timely and very accommodating." "My husband and I have been going to Sunshine Ray Motors for years and will continue to do so because their service is the best in town. They listen and always keep you informed in everything they do or what needs to be done." "Great work at reasonable prices and seem to always go above and beyond"
"Customer service is friendly and helpful and the quality of work is outstanding." "I'm very happy with sunshine rae." "They overcharge for a diagnosis that couldn't even be done on my vehicle. They had it over the weekend and still couldn't figure out what the problem was. I'm sorry if I'm going to pay 350 for a 105 dollar diagnosis I think timing is a huge matter." Very interesting that you claim to have been charged for any services. As you know you where told to pick up your vehicle with no charge. Sunshine RAE Motors does not expect our employees to have to deal with rudeness and foul language from any client ever ! "Great service. Fast feedback. Easy to make appointments online or by phone." "The quality of work is very good. They always pay attention to detail and correct problems without delay. The service is first class.I would recommend them to anyone them to anyone who needs service on any import or domestic." "You replaced a fuel pump that had no problem with a new one. An unnecessary expensive repair. Later found out it was another problem and looks like it maybe fixed this time. An unhappy customer, feel like you owe me something"
So sorry to hear you are unhappy with your service. On 1-11-17 you had your vehicle towed into the shop with no fuel pressure. Fuel pump was replaced and you drove away. You returned your vehicle on 9-12-18 vehicle had fuel pressure pump is fine. Codes reveled no communication with ignition pass lock. repaired as needed. Repairs are not related other then you had a no start each time with your vehicle. Hope all is well with Roy and have a great day." "I have been very pleased with the service I have been provided"
"Exceptional and that we take every one of our vehicles there." "I regularly recommend your shop to everyone I know and many have taken their business to you as a result. I tell people your service is awesome and the quality of the work done, is top notch and thorough. Thank you!" "Reliable & trustworthy service. They go the extra mile to provide whatever service is needed"
"Excellent service. Very friendly and very precise in work ability and desire"
"Get your engine clean first because they wont work on it otherwise." Sadly that is not a true statement. You chose what repairs you would like to have done on your vehicle and they where done . At no point where you told we would not work on your vehicle . You where told that there was to much oil on the engine and transmission to determine the worse or needed repair ." "Jack and Marnie are real honest and hard working automotive professionals who do an exceptional job. The Staff are always positive and enjoyable to interact with. Plus, Sunshine Rae Motors are the best and most reliable mechanics in all of Fairbanks!" "Friendly professional service. Reasonable rates." "The staff was friendly, professional, and flexible. I will be coming back to them again!" "I have been very pleased with the customer service provided by Sunshine Rae's Motors. Before my husband passed on he took care of my car needs and appointments. I try to upkeep my car when something comes up on the dashboard to warn me something is wrong and its a very new experience for me trying to correct the problem plus my car is getting old." "Sunshine Rae Motors gets the job done right every time and there are no surprises when they do. I've been happy with the service I get on each of the vehicles I have brought them." "They did a good job all around." "Quality of work A+, customer service B+. I get that you do not take personal checks, but it's okay to say it nicely, even if it's the millionth time someone asks. It was my first time. Phone call to get authorization was great, work was performed very quickly, and reasonably priced. :-) GB"
"5 star service. They were quick. They fixed my car in a few hours .I'm still happy ." "Great work. But, twice I’ve had something unfinished upon picking up vehicle. Maybe a check sheet or something for service, by mechanic." "What’re you waiting for? Call them!" "I was paticularly happy with the quality of the comunications with customer service rep.
My car has been running happily, after they were able to find and address ALL of it's issues, at a very reasonable price." "Sunshine Rae's is always great about clearly and honestly communicating what needs fixing and what doesn't. Their work is excellent, reasonably priced, and always on time. I wouldn't go anywhere else in Fairbanks." "All work done to high standards, and always on time as promised. after almost 60 years of being a mechanic, if i dont do my own work, this is where i take my rigs." "Prompt, courteous and professional. I love Sunshine Rae." "That Sunshine Rae’s has always done quality work & I would highly recommend them." "That it is top quality! We always recommend people to come. We’ve sent several there already and will continue to." "Sunshine Rae is the only place I trust to work on my car. They are thorough and professional without being condescending or rude like some other shops I've been to. I just took my car in for an oil change and they noticed that my marker lights were also out. They let me know about the problem then let me decide whether to have the issue fixed now or wait, or even to do it myself. They are always customer service oriented and do it very well." "You want the job to be correctly done and any mistakes that were made to be fixed. Little things that should have been taken care of when a big job was being done did not happen." So sorry you are upset about your service. As far as we can see from your history your original repair was for cv axles . Unfortunately you have seals leaking after the extreme cold weather. This is a very common problem in cold weather. We do not replace seals at time of axles if they are not leaking. As with any repair or service we do not do or recommend unneeded repairs. Further more it is clearly posted that we do not cover rubber seals do to cold weather leakage. Once again sorry you are upset about repairs needed to your vehicle." "Very helpful counter staff! prompt service!" "You did a good job, quickly!" "Excellent customer service and repair work. Very friendly, trustworthy shop. Got my truck in right away and did a great job communicating what needed done. More than happy with their work." "The work has always been excellent, speedy, and I trust Sunshine Rae’s to be honest." "Sunshine Rae has been in operation for a long time. Marnie and Jack are honest, hardworking, fair, and will get the job accomplished professionally and as fast as possible." "Fast service. Thorough point inspection. Reasonable prices." "I asked them to put winter tires on for me, and not only did they do that they gave my car a full inspection without an extra charge - very good service." "I was satisfied with the price and timeliness of their work; they were easy to work with, excellent customer service." "Kind compassionate understanding articulate forward thinking proactive mechanics"
"Had great service and will be taking our car back as soon as I get an estimate from them." "It was awesome. When I got my invoice for my estimate, it was way over what I was told it would be on the phone. The manager knew I was low-income and readjusted it to the original quote. Great people and service will make me a return customer!" "Sunshine Rae's is awesome! I never want to have to go anywhere else." "Excellent service very good shop does not try to sell you anything you don't need"
"Excellent service at a fair price. Very friendly people run Sunshine Rae Motors!" "Sunshine Rae Motors has been great to me. Great quality of work, friendly staff and (best of all) quick turnaround time"
"Very good quality work. Knowledgeable management. Will take yr concerns seriously and explained to the best he can." "exceptional service and and customer relations"
"Did a great job on my vehicle." "We were very pleased with both the customer service we received and the work done on our vehicle. We had been given "the run around" by our dealership and two other shops, but were treated well by Sunshine Rae staff. Our request for a diagnostic evaluation was quickly granted and the recommendations for service was much more reasonable and cost effective than any other offered." "Customer service is outstanding. They are really good at explaining exactly what is going on and recommend what needs to be done. Not pushy either. Offer military discount which is very appreciated. I've never had to wait a week for an appointment. Jack and Marney always say bring it in and we will take a look at it. As in, as soon as I can get there. They are good honest people." "They do good work. They can usually see you in 1-2 days. They will tell you if something is wrong that they can not fix." "I would tell them you guy have wonderful service." "I always receive good service, and have been going to Sunshine for years because I trust them"
"I have zero complaints about the quality of the work and the customer service was excellent!" "Expensive but worth it; you get what you pay for. Pleased with their professional estimates and ability to advise on priority of repairs. Also one of the only places in town that will replace power steering hose with the heavy duty arctic stuff from Alaska Rubber and Rigging. Would definitely use them again." "They do good work and are thorough." "Sunshine Rae Motors is the place to be when it comes to automotive repair. Jack and Marney are such kind people and they would do their personal best to make sure your vehicle is safe and runs efficiently in all seasons of the year." "I have been very happy with the service I receive at Sunshine Rae. I recommend them to anyone looking for a reputable shop. They work with my warranty company and have always been extremely helpful." "customer friendly-professionl-took my wants into concideration--keep me in the loop-good people"
"These are people you can trust." "They provide exceptional customer service, very timely and are informative"
"The owners and mechanics at Sunshine Rae Motors are highly talented and honest in delivering automotive repairs and service!" "Friendly and prompt diagnostic and repair service. Focuses on what "needs to be fixed" rather than trying to sell the customer a list of "essential" repairs." "I would highly recommend the shop and let them know that they are locally owned and operated and extremely qualified and provide quality work for an affordable price. That you stand behind your work and I would not take my vehicle anywhere else." "Go there. Best service in Fairbanks." "Customer Service: Very welcoming and friendly every visit. These folks know what they are doing and are only there to recommend the best choices for your vehicle. Quality of work is great, and at a great cost for all services they are able to do. I would 100% recommend a family business such as this over another shop." "Sunshine Rae has provided quality customer service through phone correspondence and face-to-face interactions. They have explained issues thoroughly, and I have always been extremely confident in their abilities. They have shown their trustworthiness time and time again, and have made me feel like a valued customer. Finally, their services are speedy and the job is well done." "Excellent! I recommend them to everyone who needs car repairs." "Sunshine Auto was very quick to see me and were very thorough in their work." "Very customer friendly and reliable service"
"Wished could have fixed the problem"
"Shop is efficient, professional, helpful, accommodating, technicians talk directly to customers, quality work!" "I finally found mechanics I can trust!" "I wouldn't take my car any other place"
"Great shop and service with a smile." "it was one of the cheapest places to winterize your car and the customer service is good!" "I've found that they do good work and I think they're honest and reliable!" "They are friendly and well knowledge staff and do exellent work in a timely manner"
"Sunshine Rae's is honest and does great work for a fair price." "Very friendly, courteous and easy to schedule an appointment. Mechanics are thorough, competent, honest, and conscientious." "Jack and Marney have an established business that has outstanding customer service and an exceptional job with inspections, oil changes, and major repairs!" "Honest, thorough, fair, conscientious, and get the job done right." "It was fantastic. Quick emergency repair do eat estimated quoted price." "At sunshine Rae you get a fast, reliable and friendly service. They gave me shortly appointments." "I would recommend Sunshine RAE Motors. The work performed was completed promptly and within the estimate quoted. Customer service was excellent, and all of my questions were answered courteously and in a professional manor." "They can usually get you in and out in 2 days or less. Their work is good." "Sunshine Rae Motors is the best auto shop in Fairbanks. They're quick, thorough, and they don't ever try to talk you into unnecessary work just to increase your invoice." "I use Sunshine Rae the always take care of me!!" "I would tell them sunshine Rae motor is a very honest and reliable place to go." "This shop is a very honest family ran and prompt work place. very friendly people and good prices for excellent auto repair service." "That I never feel like I am cheated and I get quick, honest, quality opinions and work. I have had some bad experiences with shops in the past and I love being able to trust a shop. And how many people get to say they love to tan at their auto shop:)"
"Expectations fast with results and respond very quick..Very Friendly :-)"
"They do good work at a fair price in a timely manner,"
"The shop was helpful and did what I asked them. They charged the agreed up on price and were helpful and friendly." "I would tell them that Sunshine Rae's is a good place to take your vehicle for repair or maintenance. I had hit some ice and had rolled my Isuzu Trooper in a ditch so I called around to find someone who could get it going since I had no clue where to start after such an event. The lady who answered the phone sold me when she pointed out some standard things that were needed after rolling over with out my even asking. The other four shops who have earned a good reputation locally for quality work, didn't bring it up right away. The wrecker service also had pointed out that they did reliable work on imported vehicles. I am glad I took it there for they went above and beyond my expectations, even beating their quoted price by a few dollars and returned my old parts to me. Can't go into all the details here, but I'm sold." "Honesty along with very fast service. Always received feedback on the repair status while vehicle was in the shop. I will always use Sunshine Rae Motors for future work. I had always heard this business was highly recommended, and I will tell people to go there for repairs." "They will get you in quickly and fix the problem." "Yes. We have been using Sunshine Rae Motors for the past two decades and have had the most quality work at the most reasonable prices around town. The owners, staff, and mechanics are professional, hardworking, and get the most difficult job done well." "Good service and good price." 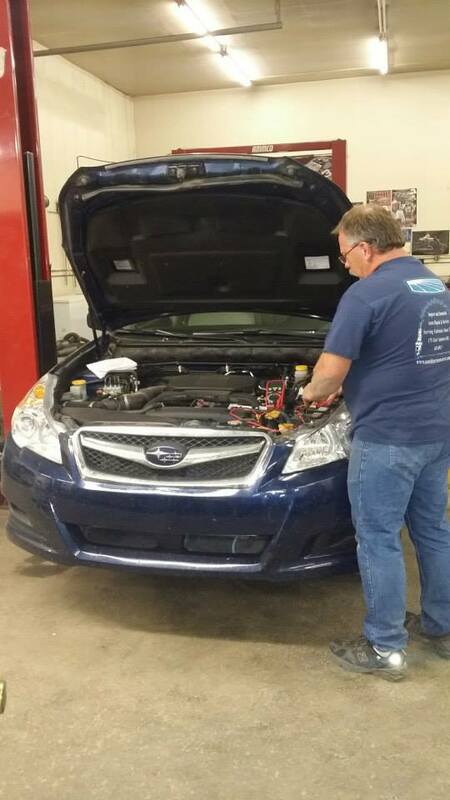 "Sunshine Rae Motors can usually get you seen in a timely manner and get the problem fixed. There usually is not a wait of over 1-3 days from the time that you call. They also take dropoffs." "I have sent many customers to Sunshine Rae in the last 31 years"
"I'm from out of town, and was made to feel so at ease getting my truck repaired and back to work the same day. I couldn't have found better service anywhere. I'll definitely be visiting them again for all my service needs while in Fairbanks!" "Sunshine Rae Motor has the best quality work you can get done on any vehicle they are reliable and dependable"
"I took my 4-Runner in to get a head gasket replaced by Sunshine Rae and they made time to fix a very big job for me. I had taken it to another shop first that was very dismissive of the problem with my car and basically told me to hope for the best and drive it until it died. I was relieved when the mechanics at Sunshine Rae had a great attitude about working with me to get my car fixed! Thank you!" "Professional, skilled and courteous service. I would recommend these folks over anyone in town, go here first and you will find an honest garage you can trust. Try Sunshine Rae once, and you’ll be return customer because they’ll earn it!" "Sunshine Rae Motors Are the best mechanics in town! Professional, thorough, and reliable!" "They do good work and are reasonable in price." "My car is running great after taking it to Sunshine rae motors, however I feel I was overchraged on labor. After calling 3 other shops in town Iand asked for quotes each one told me at LEAST 1.5 hrs less if not more. However my car is running well and they were quick about it. I would possibly return." "They have been in business prior to 1988 when we got here and are one of the few honest repair shops around. We have always received excellent service at a reasonable price from Sunshine Rae's and have highly recommended them in the past and will in the future." "They were awesome. Fixed my Jeep quickly, I am very pleased with the work." "Sunshine Rae Motors is the most reliable shop in town! They always a kind, courteous, and caring when it comes to you and your vehicle's needs." "We trust Sunshine Ray Motors w/ All our vehicle needs!!!" "They did a great job, are honest, hard working people that do their best to keep costs down, and I feel very comfortable recommending Sunshine Rae to my friends." "Patrick Mechanical is very happy with Sunshine Rae. We have a very large fleet."